Our documentary film "Remarkable Journey: Founding the Asian Indian Community in N.C." will have its statewide broadcast television premiere on May 9 at 9 p.m. on UNC-TV. Tune in to UNC-TV’s NORTH CAROLINA CHANNEL (Spectrum Channel 1276) on Wednesday, May 9 at 9 p.m. The one hour film repeats on Thursday, May 10 at 2 a.m. and 12 p.m. The North Carolina Channel focuses on civic affairs, issues, entertainment and educational programs relevant to North Carolina. Remarkable Journey, is a Video Dialog Inc. production that was completed last year. Through lively first-person stories, Remarkable Journey explores the 'pioneer' generation of Indian immigrants to N.C., as the world's oldest and largest democracies met here in the midst of the Civil Rights movement and beyond. These energetic newcomers helped fuel the expansion of opportunities in science and business in our region, as they met the challenge of passing the "essence of India" on to their children. March 11: Premiere at the Carolina Theatre, Durham, N.C.
March 30-April 1: Four screenings at The Cary Theater, Cary, N.C.
April 27: Charlotte Asian Film Festival, Charlotte, N.C.
July 5: N.C. Hindu Society, Cary, N.C.
August 18: BB&T Corporate Center, Greensboro, N.C.
September 9: Charlotte India Festival, Charlotte, N.C.
November 5: N.C. Museum of History, Raleigh, N.C.
November 10: Triangle Community Foundation, Morrisville, N.C.
November 13: University of North Carolina, Chapel Hill, N.C. In a period of our nation's history where the value of immigration is being questioned, this is a unique opportunity to celebrate our diverse community! Join us for a Remarkable Journey as we bring this amazing film to North Carolina's state capital. Seniors and families welcome! This screening is FREE. CARY, N.C. (March 20, 2017) –The Cary Theater will showcase a locally produced documentary film, “Remarkable Journey,” which chronicles the migration of Asian Indians to North Carolina. The one-hour film premieres in Wake County at The Cary on March 30 at 7 p.m., with additional screenings on April 1 at 2 p.m. and 7 p.m., and April 6 at 2 p.m. Tickets to all screenings are free. 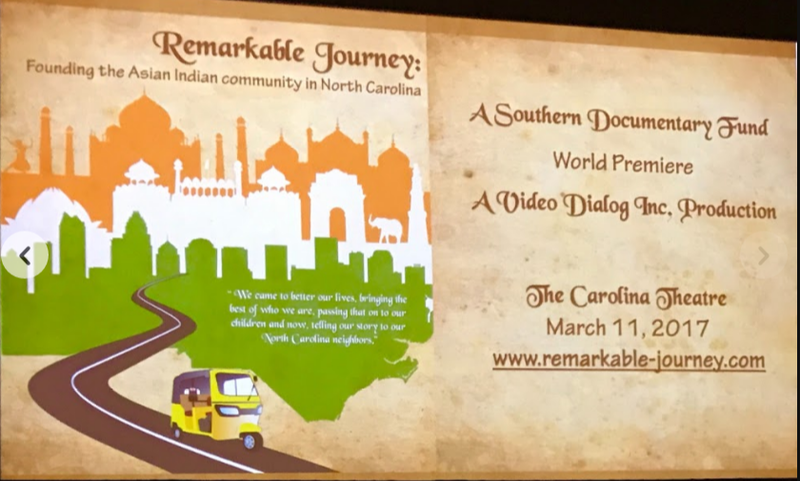 Five years in the making, “Remarkable Journey: Founding the Asian Indian Community in North Carolina” has its Cary premiere on March 30 at The Cary Theater. The documentary is produced by Durham resident, Dr. Steven Channing, Emmy Award-winning filmmaker. The film chronicles the growth and impact of Indian culture in the state. Tickets to all screenings are free. Through lively first-person stories, the film explores the pioneer generation of Indian immigrants to North Carolina, as the world's oldest and largest democracies met here in the midst of the Civil Rights movement of the 1960s and the years following. These energetic newcomers helped fuel the expansion of opportunities in science and business across the Research Triangle and around the state, as they met the challenge of passing the “essence of India” on to their children. The documentary highlights the story of Hindus, Muslims, Sikhs, Jains, Christians, Jews and others living and working together through respect and determination. Remarkable Journey is aimed for eventual public broadcast as well as distribution with a teaching toolkit to schools across the state. After its screenings in Cary, the film will available to view in homes, temples, mosques and churches, and shared with families in India. The Cary Theater, located at 122 E. Chatham St. in downtown Cary, lights up downtown with its mission to provide a unique setting for the community to experience art house cinema and live performances that enhance the cultural arts experience in the Town of Cary. Originally constructed in 1946 to serve as the Town’s first indoor movie theater, The Cary was meticulously restored in 2014 to create a vibrant space downtown that offers independent film, live performance comedy and improv, the Six String Presents music series as well as other live events. The Cary is owned by the Town of Cary and operated by the Department of Parks, Recreation and Cultural Resources. For the latest schedule, please visit our website. At a moment when the value of immigration is being questioned, over 1,000 locals took the opportunity to celebrate our community of Indian residents and their impact on our state. Our premiere at the Carolina Theater in Durham was a rousing success, filled with many of the participants in the documentary and their friends. Check out the great article on our work in progress. Go to page 38 to read all about our Remarkable Journey.